Prompted by technology trends like IoT and cloud computing – along with strict regulations designed to protect individuals’ personally identifiable information (PII) – personal data protection has become a top priority at many organizations. Seeking to comply with regulations like the General Data Protection Regulation (GDPR), business leaders are focused on making sure they appropriately track, trace and protect the personal data that flows across their transactional systems, application databases and other sources. Numerous capabilities of SAS Data Management software can help in these efforts. 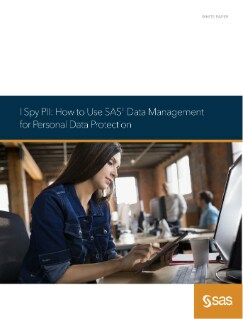 Follow this step-by-step guide to learn how to use specific components of the software to access, identify, govern, protect and audit personal data across your entire organization.